Climbed on skis in January 1972. 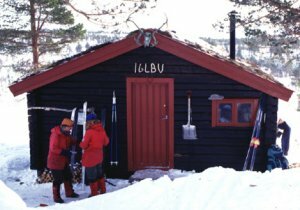 How to get there: We started this ski trip from the "Koie" Iglbu, a small hut owned by NTNUI. Route description: We had an old map from the nineteenth century in scale 1:100.000. The route we took should not be tried again. Comments: On the way to this mountain, we crossed over the top of another mountain (stupid, or at least very inaccurate naviagtion..) While finding a skiable route down from this mountain, I skied onto ice, fell and started sliding towards the edge of a vertical cliff. I managed to self-arrest just above the cliff (which was perhaps a 100 meter vertical), quite a scare for life..
We finally hit the summit, just as the sun set, having used all day (and all daylight) on the climb. The return ski was long and dark.